Bem em qualquer lugar ! 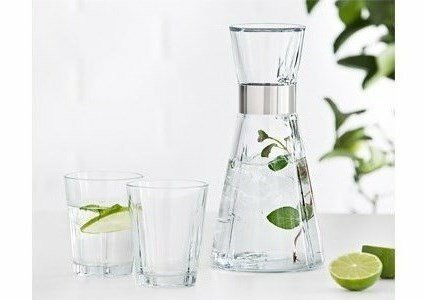 Grand Cru water carafe... A design collar with a simple steel bow around the neck. Cool or plain water, it will never be the same. Pour water seasoned with mint, cucumber, lemon and follow a delicious meal with a flavoured touch. Place small fruits and freshen up a hot summer afternoon! Grand Cru line provides the basic kitchen ideas, that will last a lifetime and are easy to match any tableware and cutlery.